In November 2008, after five unsuccessful attempts since 1980 to take redistricting out of the hands of legislators, the governor was successful in championing a ballot initiative approved by voters, to make voting districts more competitive and candidates more accountable to the people. Proposition 11 created an independent 14-person commission to draw boundaries for the Senate, Assembly, and Board of Equalization. The board is composed of five Democrats, five Republicans, and four others selected through a nomination process overseen by the state auditor. The Governor successfully led the effort to pass an Open Primary ballot initiative to elect more moderate candidates to office who would not be beholden to the parties and special interests. Proposition 14, approved by voters despite opposition from both parties, required candidates for statewide elections to run in a single primary that is open to all voters. The top two finishers, regardless of party, advance to a general election runoff. 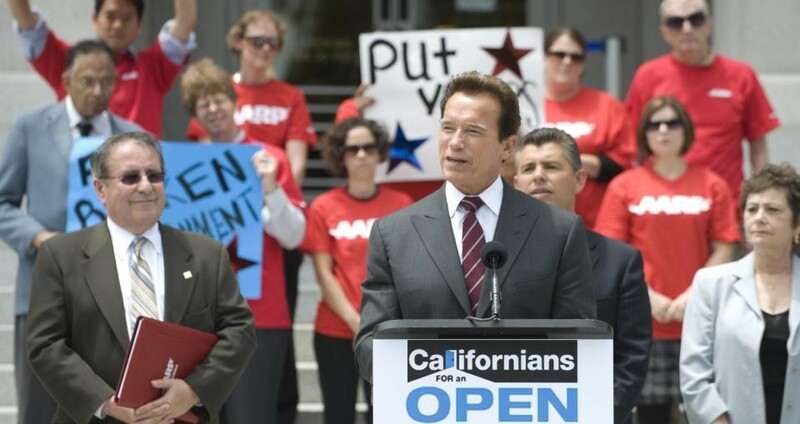 Governor Schwarzenegger supported the passage of “The Sunshine Initiative” in November 2004, making access to government records and meetings a civil right under the California Constitution. In September 2006 the Governor supported and signed legislation requiring organizations to fully identify themselves to voters when making mass campaign solicitation calls or when contributing $5,000 or more. In May 2010, the Governor supported and signed legislation increasing public access to online information regarding campaign contributions and expenditures by candidates, officeholders, committees, major donors, and slate mailer organization. Recognizing that there is nothing more important to democracy than voter participation, Governor Schwarzenegger supported and signed legislation in September 2008 allowing California to register online to vote.